Jennifer says: "It's the deforestation issue which is the overriding factor, the one non-governmental organisations are campaigning for, and that my work has focused on. The sustainability standard is a process of continuing improvement. There has been a knowledge gap for some time on how big set-aside needs to be to support biodiversity. Until now, growers have been told bigger is better and no-one was willing to put a number on it, which meant it was left up to companies to decide how much to give up." With more than 60 million tonnes of palm oil produced worldwide—of which just under a fifth is certified as sustainable—consumers question why it is used in so many products. One of the most common uses of palm oil is as a preservative to extend the shelf-life of various foods, leading some to ask whether substituting it for another oil would help. Jennifer says: "Oil palms produce at least six times more oil per hectare than the next most productive crops, such as rapeseed or soy, so switching is not a more sustainable option." 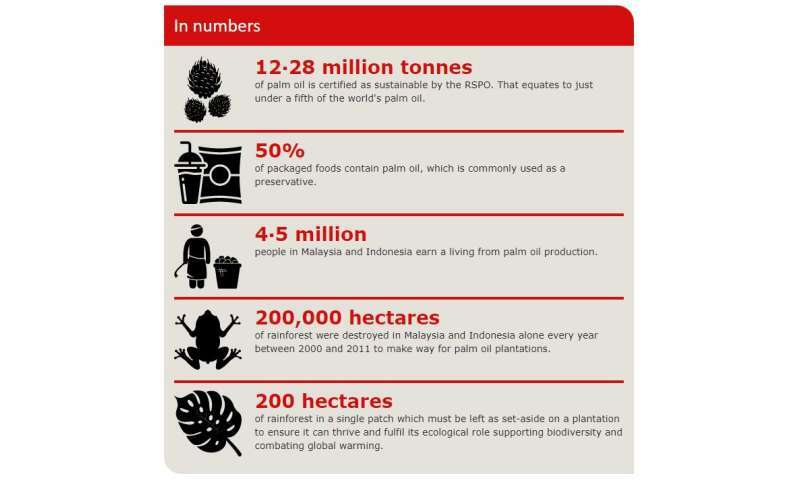 Palm oil has no place in stead of forest; we need more forest, not less. If you want palm oil build plantations elsewhere; in arid coastal areas, making use desalinated sea water through solar and wind powered irrigation grids. That way you can grow Palm oil very well in southern Europe, Australia, North Africa, and all around the mediteranean sea. Simple, better, closer to markets, and it will even provide jobs an habitat for climate refugees. Who's in for crowdfunding a trail project?